The county had $3.1 million in 2009 SPLOST revenue set aside for Water and Sewer Facilities, Recreation, Historic and Scenic Facilities, Fire Station Facilities and Equipment, and Farmland Protection. The Oconee County Board of Commissioners has agreed to spend some of these reserves as well as revenue from the 2015 SPLOST as part of the Fiscal Year 2018 Budget that went into effect on July 1 of this year. The county’s four cities did not receive revenue from SPLOST 2004 but have spent all of the revenue received from the 2009 SPLOST. This information comes from the report on SPLOST revenue and spending that the county has to make public at the end of each calendar year. The report covers the period ending June 30, 2017. The county is required to publish its annual SPLOST report in the county’s legal organ, The Oconee Enterprise, by the end of this year. I obtained a copy through an open records request I filed on Nov. 20, asking that the report be made available to me as soon as it was produced. County Clerk Kathy Hayes sent it to me on Dec. 15. The report covers the 2004 SPLOST, which terminated at the end of 2009, the 2009 SPLOST, which closed out at the end of 2015, and the 2015 SPLOST, which began in 2016 and will run through 2021. The 2004 SPLOST information and the 2009 SPLOST information are included in the report because the county has not spent all of the revenue those taxes produced. The report is the only public accounting the county gives of SPLOST revenue and spending. The county does not have a citizen oversight committee to monitor SPLOST spending, as do other counties, including neighboring Clarke County. The 2004 SPLOST was projected to bring in $25 million, but it outperformed expectation. The money collected, with interest earned, stands at $26,379,005, according to the report. The county spent more money than collected for all of its 2004 SPLOST categories except Fire Station Project, where it spent exactly the projected $1.5 million, and County Facilities Expansion and Renovation, where it has spent only $1,381,088. The county budgeted $4.6 million for County Facilities Expansion and Renovation and is now projecting it will spend that amount at some point in the future. The county spent $314,340 from County Facilities Expansion and Renovation in the Fiscal Year ending June 30, 2017, but the report does not indicate how that money was spent. The county is engaged in a renovation of parts of the Courthouse to meet security needs identified by the Sheriff. The total unspent money from SPLOST 2004 is $3,218,912. The 2009 SPLOST was projected to bring in $40.4 million, and the county and its four cities developed projects based on that amount. The 2009 tax brought in only $33,778,345, or 83.6 percent of the amount expected. The county’s share of the tax was $28,978,442, and it has spent $25,894,564, leaving $3,083,878 unspent. The county had allocated $4,212,355 of the collected 2009 SPLOST revenue to Water and Sewer Facilities and had spent only $2,776,035 by June 30, 2017, leaving a balance of $1,436,320. The county allocated $928,906 of the 2009 SPLOST revenue for Recreational, Historic and Scenic Facilities and has spent $704,456, leaving a balance of $224,450. The amount designated for Fire Station Facilities and Equipment is $3,293,400, with $2,000,258 spent and a balance of $1,293,142. 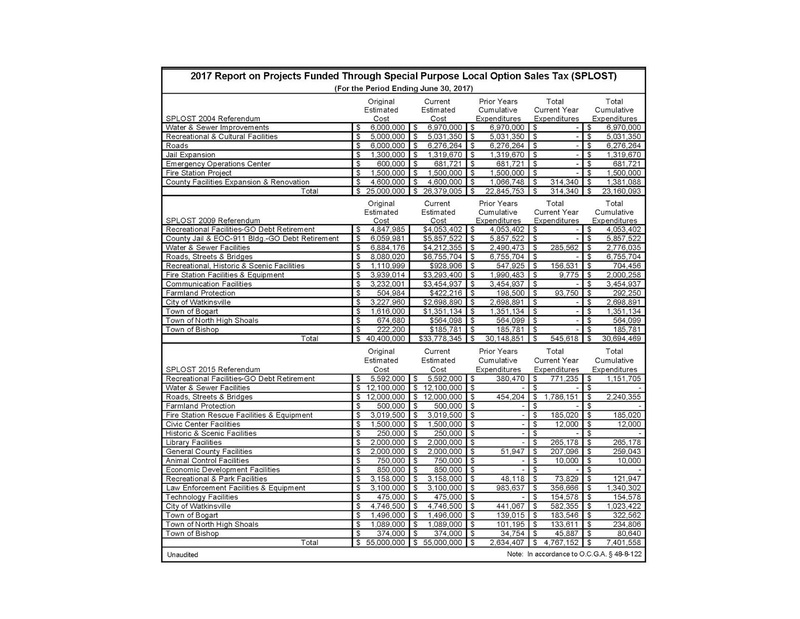 The amount allocated for Farmland Projection from the 2009 SPLOST monies collected is $422,216. The amount spent by the end of June of 2017 was $292,250, and the balance was $129,966. The 2015 SPLOST was budgeted at $55 million, and projects summing to that amount were approved by the Board of Commissioners. The county doesn’t expect to reach the $55 million figure, however, and is budgeting for something near 80 percent of the $55 million figure. As of June 30, 2017, the county had not spent any of the $12.1 million originally allocated for Water and Sewer Facilities or any of the $500,000 for Farmland Protection. The county also had not spent any of the $250,000 allocated for Historic and Scenic Facilities or any of the $850,000 set aside for Economic Development Facilities. The biggest expenditure to date has been $2,240,355 for Roads, Streets and Bridges. 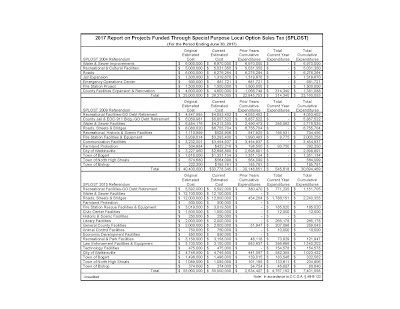 County Finance Director Wes Geddings listed several projects in his PowerPoint presentation to the Board of Commissions and to the public summarizing SPLOST spending in the Fiscal Year that began on July 1, 2017. Included were $1.6 million for road paving, $1.7 million for Courthouse security renovation, $2 million for multi-purpose fields at Oconee Veterans Park, and $2 million for Fire Station #8, the replacement for the existing Barber Creek Fire Station on the Oconee Connector. Geddings did not indicate from which of the SPLOST funds the monies would be taken. He did show a balance in collected but unspent monies from SPLOST 2015 that included $2.9 million in Water and Sewer Facilities, $626,528 in Recreational and Park Facilities, and $530,629 in Fire State Rescue Facilities and Equipment. The county plans to forward fund the multi-purpose fields at Veterans Park and borrow money for Fire Station #8 and for improvements to the county’s water and sewage treatment facilities. I am aware that the much needed multipurpose fields at Vet park are finally being developed after much delay due to unforeseen rock needing removed. Don't know how they are being funded but glad they will finally be built. This is absolute malfeasance. Why do we blindly trust county commissioners with SPLOST tax dollars when they make SPLOST promises that they consistently fail to deliver? "The total unspent money from SPLOST 2004 is $3,218,912." 2004!!! Over a decade ago. Repeat, over $3 mil left from the 2004 SPLOST??!! "The 2009 tax brought in only $33,778,345, or 83.6 percent of the amount expected. The county’s share of the tax was $28,978,442, and it has spent $25,894,564, leaving $3,083,878 unspent. " 2009!!! Another unspent $3 mil plus!! Close to a decade ago. Can't blame Melvin Davis and Benko anymore (even though they were the main offenders for the remaining millions of unspent 2004 & 2009 funds). John Daniell, just lead. Mark Saxon and Bubber Wilkes have been on the BOC for years; this is also on y'all. Mark Thomas and Chuck Horton can either step up and fix this, or be part of the problem. Millions and millions of unspent SPLOST. Should simply not happen, no excuses. Commissioners need to be held accountable to govern effectively, ethically and responsibly. That sentiment is two-pronged: 1. Less intrusion; 2. Lower taxes. For SPLOST to have back around again while money remains unspent from 2004 is utterly ludicrous. Ask any commissioner and he will robotically parrot their standard phrase: "We kept the millage rate the same. We did not raise it despite increased services." Meanwhile, that precious "Fund Balance" (slush fund) grows well beyond standard recommendations, and no one can seem to ever be able to answer a simple question: "How money is there and where is it?" Many have tried. Hard. The County is in desperate need of a Forensic Audit. Bet they'll die and go to hell before they do so willingly. I agree. We need a citizen oversight committee to prevent this from happening. They should not be "saving" money from prior SPLOSTs. This is why I personally don't vote for SPLOST's anymore. I agree with the projects, but then the available $ is not spent and the commissioners say they have to wait to see what the current SPLOST brings in when they know they have left over money from prior SPLOST's. Mr. Daniel acts like he is doing such a great favor by spending $ for the fields at Veteran's Park when they have the $ to do this and this is what they should be doing. There isn't even any water (much less a restroom) at Heritage Park day use area despite the availability of $ to do these. They won't even talk about doing it. No, they just sit on the $ for over a decade. It is a truly inappropriate way to govern. Zippity nails it. All this cash and the county is perpetually "strapped" for standard maintenance and renewal? Here's an idea: Fix whatever vague "security problem" there is so Oconee County citizens can actually use the front door down at their own blooming Courthouse. That is right, just spend the money so it is gone by the end of the expiration date. Holding money to spend on bigger projects, well that is what debt is for. Working for the feds. And turning over cash to a group of unelected citizens will definitely speed up spending. At least then the BOC can't say the mill rate is staying the same. Planning is fit private sector. Governmentshould spent what is needed to make sure scandal articles like this don't have a chance to be written.